My grandma used to make her famous carrot cake on every Christmas Eve. Her version had everything of an "old-school" cake, super sweet, moist and decorated with a bright green frosting. My mom now has her own gluten-free version (with an all-purpose gluten-free flour) with a cream cheese lime frosting. She bakes this incredible cake every single time we visit her (or for our birthdays!). "A few years ago, some friends of her ate at the Ritz-Carlton (the prestigious hotel) in Montreal. Apparently, they had eaten the best carrot cake they ever tasted. By the the end of the meal, they asked the waiter if it would be possible to have the recipe. The "legend" says that the waiter brought them the recipe on a golden paper... with an extra $900 on the bill for it! The story ends with the couple paying the bill but swearing "revenge" by sharing the recipe with the most people possible!" We'll never know if this story is actually true... (I have my doubts!) but the one thing we know for sure is that the cake is indeed AWESOME ! I wanted to do my own vegan version of my favorite carrot cake. This traditional cake recipe calls for a lot of refined sugar, white flour, eggs and a HUGE amount of oil. Therefore, I wanted to reduce the amount of oil and sugar, since I like my cakes and desserts not too sweet and healthy enough to be eaten as a "snack". 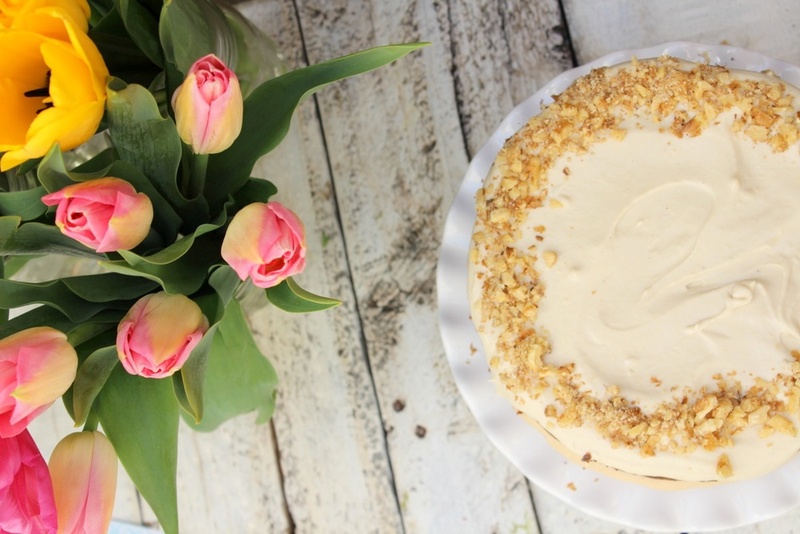 I have to say my freezer is loaded with different versions of this carrot cake... 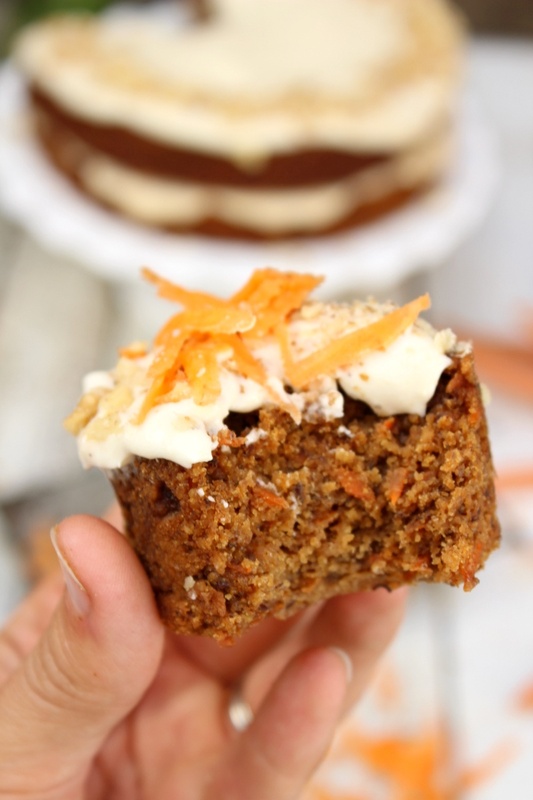 I've tried so many recipes that we even ate carrot cake for breakfast a couple of times (no one did complain though...!). I wanted to do a healthier version that still tasted similar to the original recipe. This was a HUGE challenge! I'm finally thrilled with my last version which can be gluten-free, vegan (egg-free and dairy-free), contains less fat and refined sugar (thanks to the apple sauce and bananas!) than the original recipe and is surprisingly healthy and high in fiber! The cake is moist (but not soggy! ), fluffy, perfectly sweet and loaded with carrots. I made two versions of this cake... and the good thing is it's really hard to tell which one is the gluten-free version and which isn't... ! See the pictures below? The one on the left is made with gluten-free certified oat flour and sorghum and the one on the right with sprouted spelt flour. My husband had to close is eyes to see a difference and even then, he finds it hard to guess which on was the gluten-free version. For the frosting, I've included the one I preferred, which is a maple cashew coconut whip frosting. I find that adding coconut whip to this basic cashew frosting makes it easier to spread. Another great thing about this frosting is it doesn't become too firm in the fridge. You could also decide to go with a vegan buttercream frosting. I did a few versions with simple coconut whip and find that it's also delicious and not too sweet. But as I said, if you serve the cake with a basic coconut whip, try to add it at the last moment because the whip becomes too firm in the fridge and doesn't keep the same "fluffy" texture. I even tried a vegan cream cheese frosting and it was great too! And if you're like me and you can't resist the temptation of eating a piece of cake for breakfast... you can have one without any frosting at all on it! Make sure your baking powder and baking soda are not too old! This is probably the main reason why all my past vegan cakes were not so great! If it's more than a few months old, throw it away and buy a new one! You should ALWAYS mesure dry ingredients with measuring cups or spoons (like these) and liquid ingredients with wet measuring cups (which are those red measurements pyrex cups). You'd be surprised at how the measuring method and equipment can lead to important variations in your ingredients weight, which can lead to bad final results. To measure the dry ingredients : dip your dry measuring cup into the container and lift it out. Use a straight knife, to level off the top of the cup. You can choose to do mini cakes (cupcakes) instead of a two layers cake. Just keep in mind that these cupcakes won't rise a lot so you have to fill in the muffin molds up to the end. The baking time will slightly be reduce, so you have to keep a close eye on your oven and cook them until a toothpick comes out clear. The most important thing is to understand that if you decide to change one or two ingredients (especially the type of flours or the amount of liquid), it's pretty likely that the final result will be very different than what it's supposed to be like. Trust me (it took me a few trials to get it! ), a slight change in the quantities or the ingredients can transformed a vegan cake into a cake FIASCO! Gluten-free flours don't have the same density and weight, so you can't just decide to change one flour for another. It's almost an art to understand how the flours react in a flourless recipe and thankfully I'm finally starting to get better at it! Preheat your oven to 325F. Grease and line a round 8 or 9-inch springform pan with parchment paper. Prepare the flax eggs by adding water to the ground flax. Let sit for 5-10 minutes. If your doing the gluten-free version : In a food processor, process the oats until it turns into a flour. In a large bowl, whisk together the dry ingredients ; flours, baking powder, baking soda, spices and salt. In a small bowl, whisk together the flax eggs, applesauce, mashed bananas, almond milk, apple cider vinegar, vanilla extract, coconut sugar and olive oil. Combine the dry ingredients and the wet ingredients. Add the grated carrots and stir the batter until well combined. Bake the cakes for about 30-40 minutes or until a toothpick comes out clean. If you baking cupcakes/muffins, bake for 25-30 minutes or until a toothpick comes out clean. Let the cake or cupcakes cool completely before frosting. For the frosting: soak the cashews overnight or at least 8 hours. Combine all the ingredients into a high speed blender. Blend until very smooth. Add a little more milk if the texture isn't creamy enough. In a separate bowl, whisk the coconut whip. Pour the cashew mixture into the coconut whip and whisk gently to combine. Chill the frosting for at least 1 hour before spreading. You can store the cake in the fridge for 2-3 days (the gluten-free version is better if eaten in a day or two). You can freeze you muffins or cupcakes without the frosting too if you want.